Josephus’ second reference to Jesus has been the subject of much less controversy. Jesus Myth proponent G.A. Wells’ claim that the James passage is “widely admitted” to be an interpolation is either a blatant misrepresentation or a careless statement by someone who has not done his homework. In reality, the reference to the James passage “has been almost universally acknowledged” as genuine by scholars. [82[ Of the few commentators who challenge the authenticity of the “martyrdom of James” passage in Josephus, most are proponents of the Jesus Myth. Obviously, it would not do to let this one reference in Josephus sink their entire theory, so they marshal what arguments they can against its authenticity. In the end, though, they are about as effective as sand castles trying to hold back the tide. The evidence for the authenticity of the entire passage is overwhelming. As Steve Mason points out, it fits well “into both the larger and smaller contexts of Ant. 20.” Much of the language is typical not only of Josephus, but of the unique word-choices he employs beginning in this chapter and not before. We may also note the emphasis of the passage. It does not focus on Jesus or even James, but on Ananus the high priest. There is no praise for James or Jesus. This is not what we would expect if this were an interpolation. Additionally, Josephus’ account of the stoning of James is quite different than the account given by the second-century church chronicler Hegesippus, who has James being thrown from the roof of the Temple and clubbed to death. This would be an unlikely move for an interpolator seeking to insert a Christian tradition that was widespread at the time. All told, the evidence for the genuineness of the passage is overwhelming. In light of this evidence, skeptics have become less ambitious. Rather than challenge the entire section as an interpolation, they concede that most of it is authentic but that the phrase, “the brother of Jesus, the so-called Christ” has been added by a motivated or careless Christian scribe. Thus, the passage originally referred to an unidentified “James,” but did not associate him with Jesus or Christianity. This attempt to maintain a passage consistent with the Jesus Myth is unpersuasive. Several features of the reference to “brother of Jesus the Christ” make it very unlikely that a later Christian scribe would have added it. First, the designation of James as the “brother of Jesus” contrasts with Christian practice of referring to him as the “brother of the Lord” or “brother of the Savior.” Galatians 1:19 refers to James as “the brother of the Lord,” showing much more respect. 1 Cor. 9:5 refers to “the brothers of the Lord and Cephas,” referring to Jesus with heightened respect, but not Cephas (Peter). Nowhere in the New Testament is James referred to as the “brother of Jesus.” Later Christian writings similarly adopt more elevated language when referring to James’ relationship with Jesus. Hegesippus refers to “James, the brother of the Lord”, “a cousin of the Lord”, and “the brothers of the Savior.” In short, the passage “squares neither with New Testament nor with early patristic usage.” While we would expect a Jewish author to identify James as the “brother of Jesus” it would be against the grain for a Christian to do so. An often overlooked argument for authenticity is that at the time the alleged interpolation would have been added, Christians were downplaying, not emphasizing, James’ familial relationship with Jesus. According to Alice Whealey, “…already by the mid to late second century, the mere fact that Jesus had brothers or even half-brothers was becoming highly problematic in Christian circles.” As she points out, early Christian writings such as the Protoevangelium of James, the Gospel of Peter, and the works of Origen, Hegesippus, and Jerome were stressing Mary’s perpetual virginity and deemphasizing Jesus’ familial relation- ship to James. Accordingly, a second or third century Christian interpolator would not have been inclined to stress that James was the brother of Jesus, much less to add an interpolation to highlight that fact. It is even less likely that a Christian would have referred to Jesus as the “so-called Christ.” The term translated here as “so-called” is legomenos. As in the English translation, this reference could be seen as disparaging and skeptical of whether Jesus was the Christ. At best, the remark is a neutral reference that simply notes that Jesus was “called” Christ, rather than claiming that Jesus was the Christ. Any Christian scribe that was motivated enough to interpolate a passage aout Jesus would be unlikely to rob himself of the purpose of doing so by making what could be taken as a disparaging remark by Josephus. Despite the equivocal nature of such a statement, some Jesus Myth proponents argue that the reference to Jesus as the “so-called” Christ is evidence of Christian interpolation because there is a similarly worded phrase in Matthew 1:16. But taken as a whole, the New Testament usage casts further doubt on the notion that a Christian would have referred to Jesus in this way. Matthew 1:16 is atypical because it is used at the end of a genealogy introducing the subject of Jesus which begins by declaring that Jesus is Christ. Once Jesus is introduced, Matthew refers to Jesus as the Christ in unequivocal ways, such as Peter’s declarative, “You are the Christ.” (Matt. 16:16) When Matthew later uses the phrase “called Christ,” he puts it in the mouth of the pagan Pilate. (Matt. 27:17; 22) Obviously, the pagan executioner of Christ is not an example most Christians would emulate. Other New Testament passages also use legomenos to imply doubt about an object’s identification. Paul refers to the pagan deities as “so-called gods” in 1 Cor. 8:5. When discussing the separation of Gentiles and Jews, Eph. 2:11 refers to “Gentiles in the flesh, who are called ‘Uncircumcision’ by the so-called ‘Circumcision.’” In other places in the New Testament, this term is used in the neutral way to note what someone was called (Matt. 10:2; John 9:11; Col. 4:11). Along the same lines is John 4:25, which notes that the messiah is “called Christ,” but does not use legomenos in association with Jesus. John is explaining in a side note to his audience that Christ is a title associated with messianic expectations. The complete Concordance to Flavius Josephus translates legomenos as ‘so-called’ or ‘alleged’, and refers as an example to Josephus, Contra Apionen II 34, where he speaks of Alexandria as Apion’s ‘not birthplace, but alleged (birthplace)’. Even if legomenos does not necessarily carry this dismissive tone in our passage, it is hardly conceivable that a Christian interpolator could have been content with so non-committal a phrase. In conclusion, the arguments for the passage’s authenticity are very strong, while the attempted rebuttals are unconvincing. Arguments that seek to cast doubt on the reference to “the brother of the so-called Christ” are few and unpersuasive. Earl Doherty argues that the phrase is not genuine because although James is the subject of the sentence, Jesus is named before him. But this is a misleading line of argument, because whichever name appears first, Josephus mentions James first as “the brother.” In any event, a better explanation for the sequence of the names is that Josephus referred to Jesus’ name first because he was the better known of the two figures and therefore was a point of reference. James was a very common name for the time. In order to distinguish this James from any number of other individuals named James, Josephus refers to the better known brother. Josephus’ audience was largely non-Jewish and would have been better acquainted with the founder of Christianity. Another argument raised by Jesus Myth proponents is that the passages’ failure to explain the meaning of the term “Christ” reveals a Christian hand because Josephus would have taken care to explain the purportedly unfamiliar term to his pagan audience. According to this argument, only Christians and Jews would know without explanation what the term “Christ” meant. This argument lacks force, however, because Josephus does not appear to use “Christ” as a term of art to reflect messianic perspectives about Jesus. Rather, he uses it as a name or title with which Jesus is associated in the mind of Josephus’ audience. There is ample evidence that Romans knew that the founder of the sect of Christians was known as “Christ”, even if they did not know the origins of the word itself. Mason, Josephus and the New Testament, 239. Wells, The Jesus Legend, 53; Doherty, op. cit., 218. As quoted by J.P. Meier, op. cit., 58. In response, Wells argues that “an interpolator might well have been aware that an orthodox Jewish writer could not possibly be represented as calling Jesus ‘the Lord.’ We do not have to assume that all interpolators went to work with more piety than sense.” Wells, The Jesus Legend, 53. As discussed above, however, the “brilliant interpolator” theory has little to commend it. Wells, Did Jesus Exist, 11. France, op. cit., 171 n. 12. The above was authored by Chris Price. 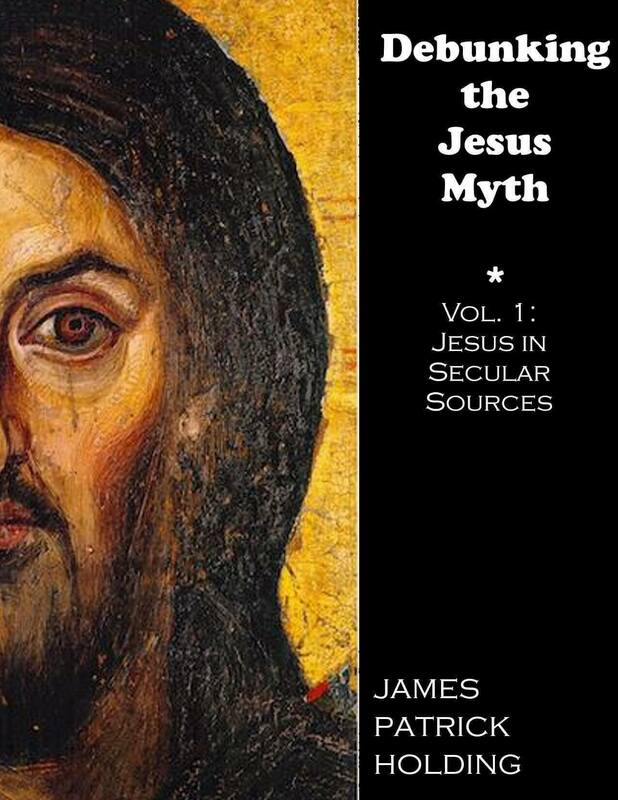 For more on the authenticity of Josephus' references to Jesus, see Debunking the Jesus Myth, Vol. 1.